You are currently browsing the archives for the Lot category. By faith, Abraham had responded to the call of God, and left his homeland. God promised Abraham many blessings. (See Genesis 12:1-3, 7) You might say that Abraham was in an expectant frame of mind. After all, God had promised him much. It would have been easy for him to be expecting much for himself. Abraham and his nephew Lot were traveling and living together, and God had blessed them both. They had both prospered, so much so that the land was not able to support their flocks and servants. There was a lack of supply for the demands that their increasing flocks had. Abraham took the lead in finding a solution. He suggested that they separate, in order to avoid further strife. It wasn’t a matter of jealousy or competition between them. The land was simply unable to support them both, and it became a matter of logistics, and Abraham’s desire to live in peace. Abraham gave Lot first choice about which portion of land he would prefer. 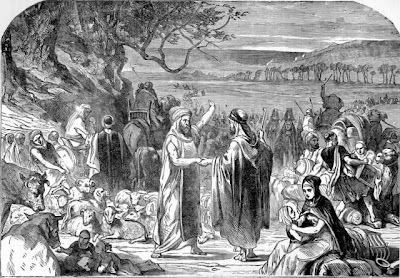 Though having received promises that the land would be his, and besides the fact that he was the elder relative, Abraham gave Lot first choice regarding where he wanted to live. Abraham settled for second choice. He took what was left over. Abraham’s solution started with him being second. It was then that God repeated his promise to Abraham, and even increased the revelation of the promise, giving more detailed revelation and instruction. (Genesis 13:14-18). Abraham took second place to his younger nephew. He took second place though the promise of the land had been given to him. He did not demand his rights, or claim superiority by reminding Lot that the promise of the land was to him, not to Lot. Further revelation and direction came after Abraham denied himself the position that was rightly his. What promises has God given to you? What God given rights do you have? What God given respect ought to be given to you? I would say that God has given all of us promises, rights, and the desire for respect. And yet…is your desire to live in peace with those around you, or to have your God given rights? Abraham chose peace over his rights. What was the result? An additional revelation from God. God once again reminded Abraham of His promise to Abraham, and then told Abraham to begin to “see” the land, walk the land, envision the promise, to prepare for what God would give him. Self denial brought revelation and instruction, which further bolstered Abraham’s faith. Abraham gave up the lesser (the plains of Sodom) for the greater (the revelation of God). In the end, Lot’s choice cost him much. Abraham’s self denial brought him much. Jesus chose to pursue peace instead of His rights. There are great blessings that follow “after” we do what Jesus would do. Follow Jesus, and know that an “after” will come to you.